iLuminate will light-up the stage Feb. 24, 7 p.m.; Feb 25, 12:30 p.m., at Alberta Bair Theater. Celtic dance and music come alive at 7:30 p.m., March 1, at Alberta Bair Theater. Audiences will roll at this adaptation of, "Monty Python and the Holy Grail," 7:30 p.m., March 6, at Alberta Bair Theater. The Irish Comedy Tour, Damon Leibert, Derek Richards, Mike McCarthy, and Derrick Keane will have audiences laughing out loud at the Alberta Bair Theater. With a score by Cyndi Lauper, this production will have audiences dancing the night away at 7:30 p.m., March 18, at Alberta Bair Theater. Gabriel Royal joins Montana's own Supaman for unforgettable evening of music and history, March 22, 12:30 and 7:30 p.m., at Alberta Bair Theater. Supaman takes the stage with New York cellist Gabriel Royal March 22, 12:30 & 7:30 p.m., at Alberta Bair Theater. The Glenn Miller Orchestra will have audiences swingin' at 7:30 p.m., April 2, at the Alberta Bair Theater. Root for the runt at this production of Charlotte's Web, April 5, 9:30 a.m. & 12:30 p.m., at Alberta Bair Theater. All experience levels welcome for this workshop April 6, 10 a.m. to 4 p.m., at the Yellowstone Art Museum. Learn how to safely use alcohol inks from 10 a.m. to 4 p.m., May 4, at the Yellowstone Art Museum. String Theory will be on exhibition March 21– July 7, at the Yellowstone Art Museum. Works by Michel T. Desroches will be on display March 21 – July 7, at the Yellowstone Art Museum. 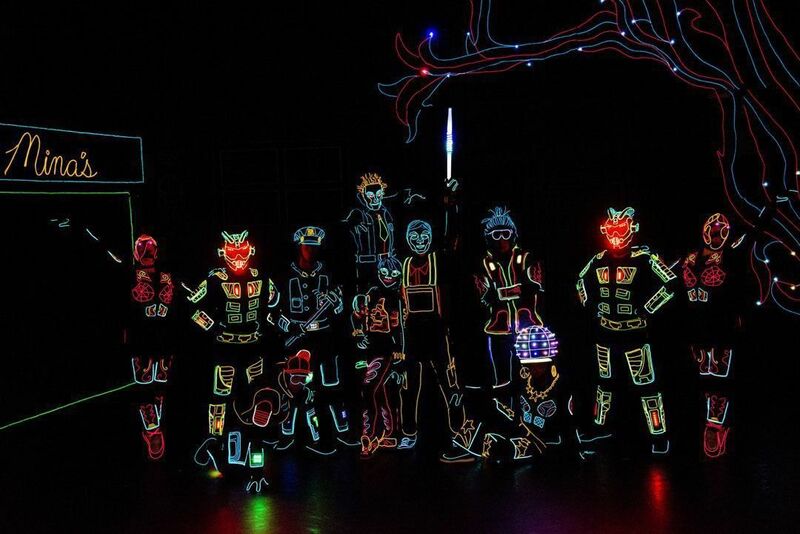 This family-friendly show will delight all ages as trained dancers in glow-in-the-dark costumes create a unique visual experience. From ballet to hip hop, expect an evening of unforgettable choreography and beautiful light illusions for all. Date & Time: Feb. 24, 7 p.m.; Feb 25, 12:30 p.m.
Tickets: Call ABT at (406) 256-6052 or visit albertabairtheater.org. A little boy finds a new best friend – one problem, he’s an alien. Now, he needs to find a way to get his new friend home to his planet. This fun-filled show encourages love and acceptance with enchanting music and an endearing story of friendship. Date & Time: Feb. 26, 9:30 a.m. & 12:30 p.m.
Twenty-two dancers and seven musicians bring the narrative myth of two Celtic tribes who need to come together to establish peace for their lands to the stage. Filled with drama, incredible dance, beautiful music – all immersed in Irish legacy – this will be an evening of fantastic storytelling. Date & Time: March 1, 7:30 p.m. Adapted from the classic film, "Monty Python and the Holy Grail," SPAMALOT brings audiences to the Round Table as King Arthur and his knights seek the Holy Grail. This slap-stick, laugh-out-loud production features classic Monty Python characters like killer rabbits, flying cows, and taunting Frenchmen. Through amusing musical performances, go back to medieval England with this satire of the Arthurian legend. Date & Time: March 6, 7:30 p.m. This raunchy group of comedians bring some Dublin swag with their no-holds-barred wit. With an ancestry straight from the Emerald Isle, Derek Richards, Mike McCarthy, Damon Leibert and Derrick Keane will have audiences rolling with stories of outrageous family members, hilarious jokes, fiddle-playing, singing and so much more. This will be dynamic evening with these sidesplitting Irish-American jokers that you will not want to miss. Adult audiences only. Date & Time: March 8, 7:30 p.m. Discover a time and culture long forgotten in Chinese history. Through Chinese dance, Shen Yun performing arts takes the audience to a mystical world of ancient China, where legends are real. With vibrant veils, multi-colored costuming and visually stimulating backdrop, the performers of Shen Yun will amaze spectators with incredible choreographies and meaningful storytelling. Date & Time: March 12, 7:30 p.m.
Luck always happens in the most unlikely of ways. Inspired by true events, this production follows Charlie Price, the owner of a rundown shoe factory that is about to go belly-up – until Lola steps into his life. From the dank factory floors of Price & Son to the fashionista catwalks of Milan, this fun musical with score by pop icon, Cyndi Lauper will have you stomping your heels. Date & Time: March 18, 7:30 p.m.
What do you get when you pare a member of the "Apsaalooke Nation" and Brooklyn subway musician? An unforgettable evening of diverse artistry. Montana’s own, Supaman takes the stage with New York cellist Gabriel Royal for an evening of dance, jazzy pop music, as well as Native American Flute and culture. Date & Time: March 22, 12:30 & 7:30 p.m.
Dr. Jane Goodall is a name that resonates with most as the leading expert on chimpanzees. This delightful tale takes the audience to Goodall’s childhood, when the only chimpanzee in her life was a toy named Jubilee. Bring the kids for a heartwarming adventure as Jane and Jubilee explore why conservation is so important and how all life should be protected. Date & Time: March 28, 9:30 a.m. & 12:30 p.m.
Coming out of the Swing Era of the late 1930s to early 40s, The Glenn Miller Orchestra continues to honor its namesake with sensational “big band” music that has audiences dancing in their seats. With 18-members, the band carries on the tradition of arrangements from Miller, himself, delivering jazzy melodies that appeals to all ages. Date & Time: April 2, 7:30 p.m.
Thirty years ago, the Pixies emerged from Boston, Massachusetts, setting the alternative rock stage for bands of the 90s to thrive. One band breakup later, a regroup, and exodus of members, the Pixies are back and true to nature, embrace their transformation. Playing songs from the new album, “Head Carrier,” fans can expect a new version of the beloved band as they continue to make great music while evolving their melodic collection. Date & Time: April 3, 8 p.m. The tale of one terrific pig comes to the stage in this endearing adaptation of E.B. White's timeless tale of unyielding friendship. Barn spider, Charlotte, will do whatever it takes to make Farmer Zuckerman believe runt of the litter, Wilbur, is a prize hog. With Fern and all of the farm animals to help, the characters discover that bravery comes in all sizes. Date & Time: April 5, 9:30 a.m. & 12:30 p.m. The ABT will come alive with this cherished, musical tale based on the true story of Maria von Trapp and the seven von Trapp children. Filled with love, valor and importance of family, this enchanting musical narrative will have audiences envisioning their favorite things. Date & Time: April 8, 7:30 p.m.; April 9, 7:30 p.m.
To view movie showings at Art House Cinema & Pub, visit arthousebillings.com. To view classes and seminars at Billings Public Library, visit billingslibrary.org. Celebrating composers, J.S. Bach, George Fredric Handel, and Antonia Vivaldi, the Billings Symphony Orchestra & Chorale will honor the incredible Baroque composers who created the mainstream idea of classical music. Date & Time: March 16, 7:30 p.m. Celebrating two of the most prominent influences in classic music, acclaimed pianist, Brian Ganz returns to the Alberta Bair to perform Beethoven's Emperor Concerto and Brahms Symphony No. 1. Noted as one of the most admired pianist of his time, Ganz has played as a soloist with the most prestigious symphonies across the globe. Prepare for an evening of classical masterpieces that allow audiences to experience art in this eternal form. The production features a narrator that speaks directly to the audience and steps in as various characters in the play. Set in the town of Grover’s Corners, two families are exposed in their normalcies, relationships and deaths. The relatable and emotional drama combined with the bare stage still resonates with audiences today. Date & Time: Feb. 22, 7:30 p.m.; Feb. 23, 7:30 p.m.; Feb. 24, 2 p.m.
Tickets: Call (406) 591-9535 or visit novabillings.org. Gotta have that funk! This high school improv troupe performs the first Friday of every month with hilarious skits borrowed from popular shows like “Whose Line is it Anyway?” Audiences cannot help but get caught up the sidesplitting dynamic of this improv group where anything can happen. For over 20 years, this improv group has been amusing audiences with their witty stage rapport. With various games and different actors taking part each time, this fresh approach to theater production offers a hilarious and unpredictable result that has kept audiences coming back for more. Treat yourself to a refined evening of live music with local opera vocalists at OperaFest. Held at Highlands Golf Club, merriments include hors d’oeuvres, cocktails, gourmet dining with topnotch wines and silent auction. Profits will go towards fostering and developing performing arts in Billings. Date & Time: March 23, 6 p.m.
Three one-act operas, “Buoso’s Ghost,” “Bastien und Bastienne” and “A Musical Evening at Choufleuri’s” will be performed at Nova Center for the Performing Arts. With compositions by Micheal Ching, Wolfgang Amadeus Mozart and Jacques Offenbach, audiences will awe over the beautiful music and captivating performances. Date & Time: March 29 & 30, 7:30-9 p.m.; March 31, 2-4 p.m.; April 5-6, 7:30-9 p.m.; April 7, 2-4 p.m. Performed by grades 7-12, young actors perform the magnum opus by Roman poet, Ovid. From creation to chaos and all of the Greek mythos in between, audiences will find human connection in the epic poem from 8 AD. Date & Time: April 5-6, 7:30-9 p.m.; April 7, 2-4 p.m.; April 12-13, 7:30-9 p.m.; April 14, 2-3 p.m.
To view events at The Pub Station, visit 1111presents.com. Basketball teams of divisional boys and girls from Class A schools compete for a chance to go to state. Date & Time: Feb. 22-23, times vary. Tickets: Call (406) 256-2400 or visit metrapark.com. Billings Recreational hosts the largest showcase of RVs and boats in Montana. Dealers will be on-hand to speak about new manufacturing features and upgrades. Admission is free. Date & Time: Feb. 22-24, times vary. Southern B Boys and Girls Divisional Basketball Tournament will give it their best shot to go to state. Date & Time: Feb. 28-March 2, times vary. Vendors galore will be exhibiting products for indoor and outdoor home maintenance and renovation. With food, kid’s activities, crafts and knowledgeable retailers, there is something for everyone. Admission is free. Date & Time: March 1, noon to 8 p.m.; March 2, 9 a.m. to 6 p.m.; March 3, 10 a.m. to 5 p.m.
Players are going to get some net at the Boys Class C State Basketball Tournament. Calling all paleontologists in-the-making and dino lovers everywhere – this event is for you. From the Cretaceous to the Triassic, guests will walk through every period of dinosaur evolution with life-sized robotic models and landscapes. Learn all about your prehistoric favorites at this impressively real exhibition. Date & Time: March 8, 3 – 8 p.m.; March 9, 9 a.m. – 8 p.m.; March 10, 8 p.m. Seven days and 32 teams play hard ball in this single-elimination tournament. Date & Time: March 15, 10 a.m. to 8 p.m.; March 16, 10 a.m. to 6 p.m.; March 17, 10 a.m. to 5 p.m.
Job seekers and businesses looking to establish new partnerships are invited to Montana's largest job fair. This face-to-face environment, allows both parties an opportunity to network and find the right fit for their professional future. Date & Time: March 20, 11:30 a.m. – 6 p.m.
Styx & Larry the Cable Guy: "Laugh. Rock. Seriously." What do you get when you join a legendary rock band with one of the most recognized comedians of the last few decades? An incredible evening of classic tunes and good ol’ boy humor. 80’s rock band, Styx and Larry the Cable Guy will be hitting all of the emotional chords. Fans should be prepared to sing, laugh and have a rockin’ good time. Date & Time: March 23, 7:30 p.m.
Care to dance? Dancers and spectators are welcome to this incredible dance competition, where dancers display their talents on the stage for recognition and prizes. Participation in the event is $119 and the last day to register Feb. 25. Support the performing arts and have a great time watching talented artists dance like there is no tomorrow. Date & Time: March 29, noon – 9:30 p.m.; March 30, 7 a.m. – 10:45 p.m.; March 31, 7 a.m. – 10:15 p.m. Girls and boys off all ages lay it out on the mats for trophies and recognition for best performance. Booths of antique and refurbished vintage goods will be sold by dealers from all over the region. From era dolls to small trinkets; handmade jewelry, restored furniture and décor; and craft creations of all kinds, there is a hidden treasure for everyone. Food and drinks vendors will also be onsite. Date & Time: April 5, 5 p.m. to 9 p.m.; April 6, 10 a.m. to 4 p.m.
Post-grunge, alternative metal band, Breaking Benjamin will take the stage at Rimrock Auto Areana with guest rock bands, Asking Alexandria, Underoath and Diamante for a head-banging good time. Date & Time: April 8, 6:30 p.m. This ain’t their first rodeo. Making every second count, 20 bull riders compete for the top spot in the PBR, where awards have gone up to $140 million in prize money. The blood, sweat, dirt and tears all comes down to that eight second ride. Date & Time: April 12, 7:45 p.m.; April 13, 5:45 p.m.; April 14, 1:45 p.m. Honoring one of the most iconic bands in history, this tribute ensemble brings the legendary “Fab Four,” John Lennon, Paul McCartney, George Harrison and Ringo Starr back to the stage. Singing the hits that fans know and love, take a colorful journey back to Abbey Road. Date & Time: April 22, 7 p.m.
Women who need assistance with parenting, careers, healthcare, finances, education and so much more are encouraged to attended The Montana Women's Expo. Local professionals will be on-hand to answer questions and provide information. Admission is free. Date & Time: April 27, 10 a.m. – 5 p.m.
Why pay retail price for something that will only be used for a short time? Parents and children can explore aisles of gently-used baby items, clothing, shoes, toys, books and so much more. With items for all ages and sizes, there is something for all children. Date & Time: May 3, 8 a.m. – 6 p.m.; May 4, 8 a.m. – 1 p.m.
International dance competition featuring specialized troupes and experienced solo artists that will knock your socks off. To view upcoming exhibits and events at The Western Heritage Center, visit ywhc.org. If you have always wanted to try yoga, this is a great class for beginners. Join instructor, YungBen as he leads a restorative class that helps participants join breath, body and mind together. Walk-ins welcome. Date & Time: February 23, March 23, April 13 & 27, 9 – 10 a.m.
Tickets: $10 members, $15 non-members; call YAM at (406) 256-6804 or see artmuseum.org for more information. Come snow, rain or shine, you can always Jam at the Yam the first Friday of every month. Enjoy the music of local performers and browse the many exhibits of fine art throughout the museum. Wine bar and appetizers are also offered – a great start to any date night. Date & Time: March 1, 4 – 8 p.m.; April 1, 4 – 8 p.m.
Tickets: call YAM at (406) 256-6804 or see artmuseum.org for more information. Bring your kids and learn from a local, professional artist as they teach their favorite techniques that you get try on your own. Laugh, create and build an appreciation for arts and culture in young minds. Great for all ages. Drop-ins welcome. Date & Time: March 1, 5 -7 p.m.; May 3, 5 – 7 p.m.
Tickets: $8 for kid members, adults free; $5 for adult and $10 for kid non-members; call YAM at (406) 256-6804 or see artmuseum.org for more information. This two-day event features 30-50 artists for both silent and live auctions with raffle drawings. Tickets can be purchased individually, bundled, or at the door. Proceeds go to the Yellowstone Art Museum’s exhibitions and educational programs for the Billings community. Date & Time: March 8, 5-7 p.m.; March 9, 5-11 p.m. Kids ages 5-12 are invited to embrace inspiration at the YAM’s Visible Vault. Tour the facility and stick around for an opportunity to create your own work of art, inside of the vault. No experience necessary – just the willingness to have fun. Registration opens one week in advance. Date & Time: March 9, 10 a.m. to noon. Tickets: $8 members, $10 non-members; call YAM at (406) 256-6804 or see artmuseum.org for more information. Don’t be made as a March hare. Learn how to host a proper tea party. Attendees will learn tips and tricks on how to make your table settings and décor topnotch. Taste testing of various recipes like bite-size sandwiches, desserts, tea and other beverages will be provided and everyone gets a recipe booklet. Space is limited. Date & Time: March 9, 1 – 4 p.m.
Tickets: $35 members, $45 non-members; call YAM at (406) 256-6804 or see artmuseum.org for more information. Kids, ages 10-14, who love to roll up their sleeves and help in the kitchen will learn to create a full meal. The best part – they get to serve a parent the food they make. After the meal, parent and child will a make decadent dessert to share. Children will also get their own recipe book. Fourteen spaces available. Date & Time: March 6, 10 a.m. – 2 p.m. Learn how to paint using cold wax and oil paint with a variation of tools, some of which, may be unexpected. Learn to manipulate your devises, invent textured surfaces, and open your mind to new ways to create art. All experience levels welcome. Tickets: $60 members, $80 non-members, $50 supply fee; call YAM at (406) 256-6804 or see artmuseum.org for more information. Learn how to safely use alcohol inks and the different ways to mix and apply them to create beautiful pieces of personal art. Students should come prepared with the following: large box of cotton swabs, box of tissues, paper towel roll, old paint brushes or new cheap brushes, foam brushes, old deck of playing cards, pencils, tooth brush, wax paper and textures tools like shapers, scrapers, and stamps. Date & Time: May 4, 10 a.m. to 4 p.m.
Tickets: $60 members, $80 non-members, $45 supply fee; call YAM at (406) 256-6804 or see artmuseum.org for more information. As a daughter of Holocaust survivors, Sharon Kagan was inspired by her mother’s bravery. After the death of her mother, Kagan began knitting as a coping mechanism and unearthed an artistic ability passed down from her mother. She began interweaving hemp string and rope, then photographing, drawing and enlarging the images onto canvas. Forget what you think you know of knit-art. This exhibit grasps the chaos of grief, sorrow, inventiveness and renewal of senses into a new artistic threshold. While his paintings reflect faces on the canvas, Michel T. Desroches hopes to evoke a visceral reaction from both subject and spectator. Desroches quickly paints with a certain feeling in mind, capturing the raw impression with the brush rather than forming features on the face with line work. As an art therapist, Desroches has a desire to portray the sentiment of humanization and finding the emotion behind the face.